The 24-year-old has savoured an extremely successful 2018 season, winning five medals including three at major championships. Bajrang Punia has established himself as the undisputed superstar of Indian wrestling but the road to glory was fraught with temptations, which he had to overcome with strong will. The Commonwealth Games and Asian Games gold medallist, and the only Indian grappler to win two World Championship medals, kept himself away from a cell phone for seven long years, has never gone for sight-seeing during competitions abroad, and hasn’t ever seen the inside of a cinema hall. These are small temptations but Bajrang thinks they can easily distract, so it was necessary to keep a strong check on himself. And the results are there for everyone to see. The 24-year-old Bajrang has savoured an extremely successful 2018 season, winning five medals including three at major championships. “There are a lot of things I wanted to do but controlled myself,” Bajrang said on the sidelines of Haryana Gaurav Cup, organised by the Yogeshwar Dutt Academy. “I always wanted to have a cell phone but when I started playing international events in 2010, Yogi bhai (his mentor Yogeshwar Dutt) advised against it, saying it was a distraction. When pointed out that he has an active Twitter handle, Bajrang said it is managed by one of his friends. Bajrang has travelled to more than 30 countries for competitions and training but his stay has been restricted to the venue, hotel and airport. “I have never gone for sight-seeing after my competitions abroad,” he said. “Now Yogi bhai does not travel with me, but I prefer taking rest and concentrate on practice. Even at this year’s CWG and Asian Games, athletes would go out after their bouts but I did not. “Even at CWG when the media found me at the Games Village after winning gold, they asked me why I have not gone out with compatriots. But I said I have Asian Games and World Championships approaching, so I can’t afford to drop my guard; I have to prepare. “Now I have understood all this discipline is paramount for an athlete. It has become a habit now. I eat on time, practice on time and sleep on time. 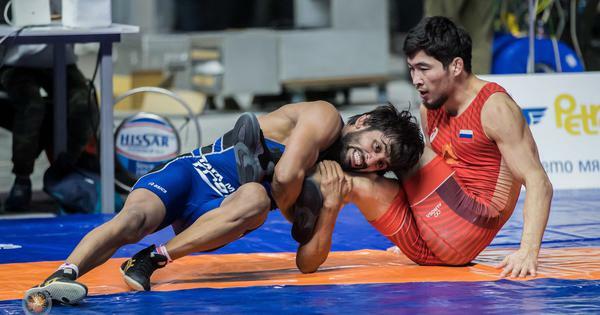 Talking about the heart-breaking defeat in the world championship title clash against Japan’s Takuto Otoguro in Budapest, Bajrang said he had no option but to digest the result. “I have to make myself understand and accept it,” he said. “I have learnt from my mistakes. I was trying for counter-attack, but I could not do it. It was his day and not mine. It was an exciting bout, going up and down. No one knew who was going to win. Bajrang said he was surprised by Takuto’s consistent leg-attack. “I have to wrestle with him again at the Worlds and Olympics,” he said. “I have been advised to work on defence and counter attacks. Yogi bhai said, overall, it was a good performance and whatever mistakes have happened, should be worked out before Olympics. “[My coach] Shako Benitidis was happy with silver. He feared that if I had won gold here, I would not have worked hard for Olympics. Now, this defeat, he thinks, will rankle me and push me harder for the Olympic gold. Three foreign coaches – Hossein Karimi, Andrew Cook and Temo Kazarashvili – will soon join the India camp to help out the wrestlers. Bajrang said although there is not much difference between Indian and foreign coaches, the foreigners do help them in finding quality sparring partners abroad. “Foreign coaches will surely help. The biggest benefit is, they are well-connected. Their network is strong. They help in getting good sparring partners when we train abroad. “When they are here, their full focus is on wrestlers in camp. In India, the coaches have a family and job obligations as well. But foreign coaches can spend 24 hours with us,” he added.